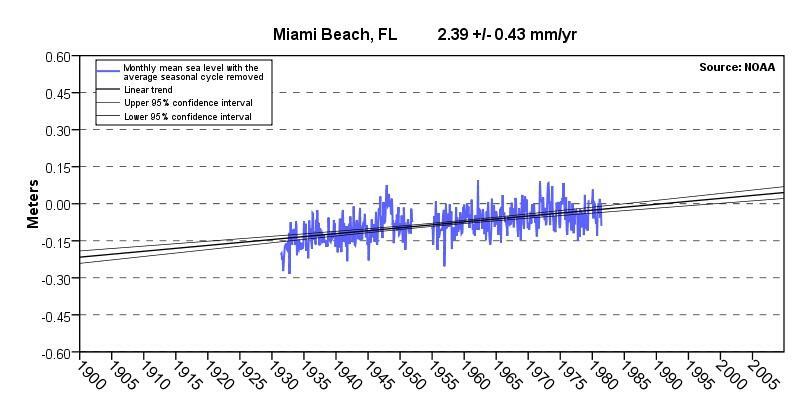 This chart from NOAA shows the monthly mean sea level in Miami Beach. The data does not include the regular seasonal fluctuations due to coastal ocean temperatures, salinities, winds, atmospheric pressures, and ocean currents. The long-term trend lines are designed by NOAA to indicate a 95% confidence level of the trend. Click the play button to hear the Elevation Zero episode of the Sunshine Economy. WLRN's Elevation Zero: Rising Seas in South Florida includes a special Sunshine Economy program exploring the potential impact of rising seas on one of our region's most important industries: real estate. Billions of dollars of real estate is vulnerable to a one foot rise in sea-level. That increase is well within the forecast range of climate scientists by the end of this century. The Miami Herald's Karen Rundlet introduces us to a lifelong Miami Beach resident (who is now a land-use attorney living on the waterfront) working to raise awareness of the threat posed by higher seas and learn from how other low-lying areas of the globe have responded. As many Florida homeowners know flood insurance rates have risen. A law passed by Congress in 2012 kicked in in October, raising flood insurance rates for many. The goal of the law is to reduce taxpayer subsidies for the flood insurance program, which is $24 billion in the hole, thanks mostly to Katrina (but also Sandy and other subsequent storms). Bryon Ehrhart is the CEO of Aon Benfield Americas, a unit of the global reinsurance broker Aon. He tells the Sunshine Economy not to expect the program to protect much against rising seas. Ehrhart calls that threat a "home maintenance issue." What role do zoning planners, real estate developers and mortgage lenders have in all this? Caroline Lewis founded and leads the CLEO Institute, a group working with local public policy officials on environmental issues. Elizabeth Plater-Zyberk is an architecture professor at the University of Miami and principal at her own design firm Duany Plater-Zyberk. Steve Cohen is executive vice president focused on commercial real estate with Sabadell Bank. All three disciplines are stakeholders in the acknowledgement and response to rising seas. Standing at the water’s edge on Florida International University's Biscayne Bay campus, Nicholas Ogle shows a crowd of teenagers what looks like a giant, rotten green bean. “We don’t want any mushiness anywhere, especially at the top,” he says, then chucks the specimen to the side.